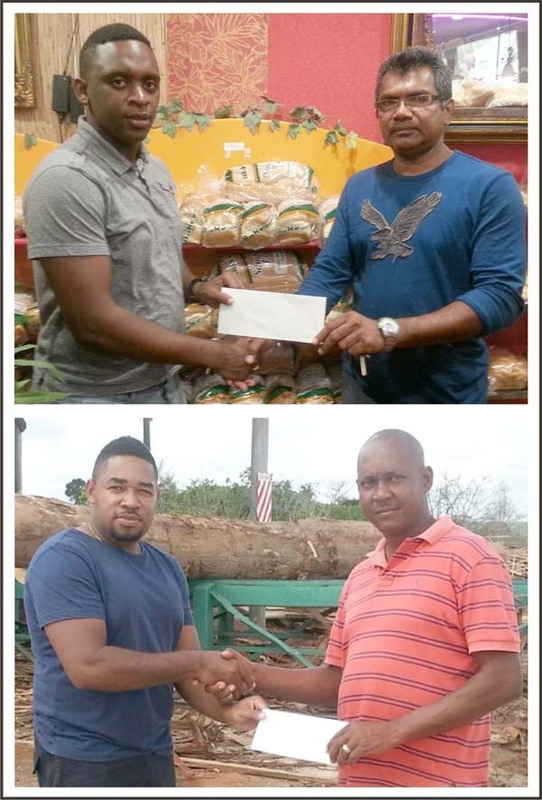 (Above) – Manager at Roti Hut, Jacob Nanan (right), hand over an undisclosed sum of cash to Aubrey Major Jnr. ahead of the NEE Futsal Final tonight in Linden. (Below) – Bella Harry (right), Manager of B. Harry Lumber Yard, supports the MVP when they presented a sum of cash to Kendrick Noel. weeks ago, will host its final tonight from 7pm at the Mackenzie Sports Club Hard Court, following the past weekends of intense rivalries in the Mining Town. As such, Roti Hut has joined a list of sponsors for the night. Along with Roti Hut, Bella Lumber Yard, S.S Little Corner and Foreign Links Auto Spares have thrown their weight behind the tournament as the curtains come down on the 2014 edition. The winner of the tournament will get $250, 000, second $116, 00, third $91, 000 and fourth $41, 000 respectively. Trophies will accompany all cash prizes. The Most Valuable Player gets a cash prize while the youngest player rides off with a bicycle.